”Malaria deaths down by sixty percent,” headlined the World Health Organisation in December 2015. The Bill and Melinda Gates Foundation claimed the achievement as due to their and other international aid programmes. But an investigation by the African Investigative Publishing Collective in partnership with ZAM shows little evidence of a victory in the fight against the mosquito-spread fever that kills hundreds of thousands children and pregnant women worldwide, mainly in Africa. In the partnership between donors and corrupt local elites, only the glossy consultants’ reports look good. Over fifteen other Kinshasa health centres and hospitals visited by Congolese team member Francis Mbala over a period of months show the same picture –nowhere does he encounter any malaria patients getting affordable help. 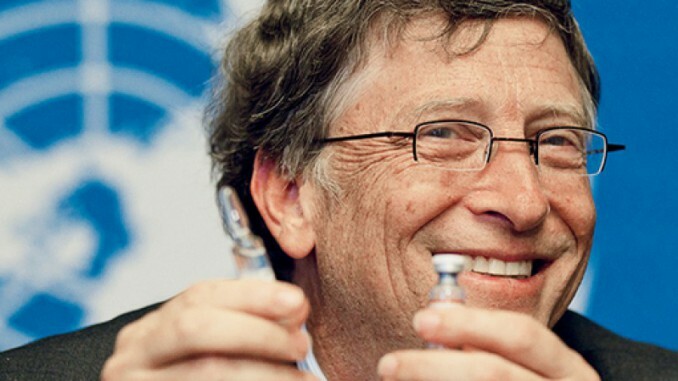 This is in spite of the fact that the Global Fund against Malaria, TB and HIV/Aids (famously established by millionaire Bill Gates and mainly funded by the US and Europe) makes over 40 million dollars available for free medicines and test kits alone to health centres in the DRC every year. “We sell the medicines to patients and to private pharmacies,” confesses a nurse in a clinic in the Bandalungwa area of Kinshasa, when Francis Mbala, undercover as a visiting fellow health worker, enquires about ‘assistance.’ She is not ashamed to admit that she, in fact, steals from the patients by ‘selling’ medicines they are supposed to receive for free. But the nurse assumes that the ‘visiting health worker’, like she herself, simple needs money to live on. Health department salaries, meagre as they are (around US$ 100 a month) are often not paid out by the DRC government for months on end. The nurse doesn’t even consider the national government as a possible source of income. Talking to Mbala, she simply complains about the NGOs: “These (NGO) people give us nothing. Only medicines. No money at all, even though they (the NGO officials in charge of the malaria programme, ed.) enrich themselves with heaps of money from the Global Fund and other donors. They just treat us as unpaid underlings. We have to do something for ourselves.” The shiny cars and the expensive laptops in the offices of SANRU, the NGO that is in charge of the distribution of malaria medicines in 219 designated health zones in the DRC, attest to the observational powers of the nurse in Bandalungwa. SANRU does not check that the medicines, which it receives for free from the Global Fund and passes on to the health department’s structures, reach the patients. Even the health department’s own chief director for the distribution of malaria medicines to Kinshasa’s health centres, Dr Anta Insa Boblaman, doesn’t seem to verify their usage. Instead, he assures Francis Mbala, who meets him in the shoe-box size central distribution centre, that there is no corruption at all. “If I would find anybody being corrupt, I would just sit on them, and that would hurt a lot,” he jokes. (Boblaman is very fat.) He adds that “all centres have been provided with free medicines already just this month.” The clinics visited by Mbala during this same week are all part of the area under Boblaman’s supervision. It could be that stocks in Lomnava are still low as a result of the warehouse fire in Ghana’s capital, Accra, that destroyed 300 000 doses of malaria treatment packets (among other medicines) in January 2015. A government commission of inquiry is presently investigating reports that the fire was set on purpose to hide evidence of theft of the very same medicines shortly before the blaze. The commission has strong indications to suspect this: a signed form by the chief of the Ghanaian NMCP shows that the malaria tablet consignment has in fact been taken from the warehouse shortly before the fire. The NMCP chief, Dr Plange, has already said that she didn’t sign for this and that the signature on the form has been forged (2). Though measures are said to have been taken to restock all the regional health centres, the new stock clearly hasn’t made it to Lomnava. Meanwhile, pharmacies in Ghana’s regional capitals sell supposedly free –or heavily subsidized- malaria treatment packets (3) for up to 8 US$: a week’s income for most of Ghana’s poor. Even in the Komfo Anokye Teaching Hospital in Kumasi, Ghana’s second city, it’s hard to get malaria treatment. Pregnant women are supposed to get the preventive Fansidar free of charge. ‘But you have to queue for hours in the hot sun, which is difficult for pregnant women or women with small children,’ with, additionally, a substantial risk of disappointment at the end of the day, says a doctor who works at the hospital. “Because sometimes they are not available. And sometimes you can’t get them for free even in the hospital itself.” Journalists in Ghana have reported in the past on ‘hospital medicines’ which, having left the hospital ‘somehow’, are sold ‘outside’ at elevated prices. Global Fund-donor Bill Gates has famously said that it’s OK with him if some donor aid is lost because of corruption, calling the slices that are creamed off “an inefficiency that amounts to a tax on aid (4).” Such a ‘corruption tax’, he says, does not matter because the ‘rest’ of the aid still reaches those who need it. Sadly, whilst this could arguably work in the case of medical programmes that don’t deal with resistant germs or parasites, this is not true for efforts to fight virulent ‘sick-makers’ like TB, Aids, or indeed the malaria parasite plasmodium falciparum. Incompetently executed programmes, leading to half-finished, interrupted treatments and people resorting to –often fake or expired- treatments ‘from the street’, are at risk of making the malaria epidemic much, much, worse. “You start getting a more resistant malaria parasite as soon as treatment is discontinued or people take fake or expired medication,” says Dutch University of Wageningen’s Sander Koenraadt. Blaming ordinary people for lack of use, or incorrect use, of the massively donor-distributed insecticide-treated mosquito nets, has become a stock response of health workers in civil society. SANRU’s deputy director Pomi Mongala in Kinshasa –seemingly unaware of the fact that in many places in her country, nets don’t even arrive because of bad or non-existent roads- talks of ‘educating’ people to ‘prevent.’ In Ghana, the deputy director of the Ghanaian coalition of health NGOs, Stephen Oracca-Tetteh, rages against the ‘ignorants.’ “Ghanaians are so ungrateful. 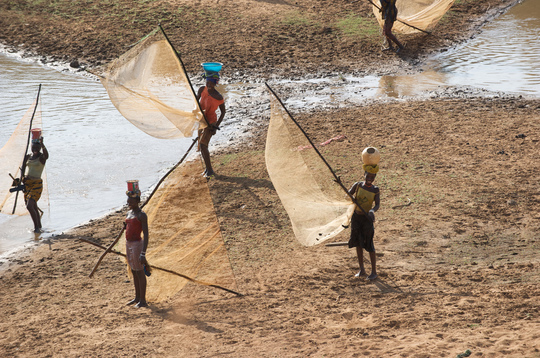 These donors work hard to bring us all these malaria nets and the people don’t even use them.” Oracca-Tetteh feels that there should even be ‘sanctions’ for people who use the nets wrong: for fishing, for example, or in soccer goals. 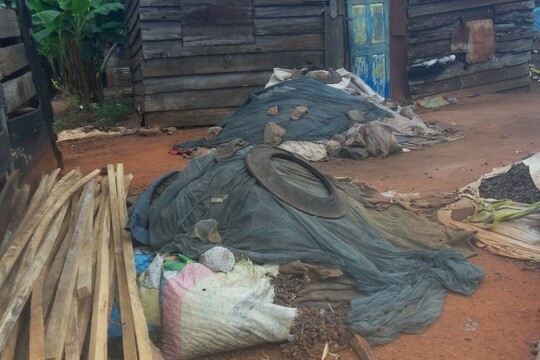 Tsigha’s neighbour, Opanin Osei Yaw, is using his insecticide-sprayed malaria net to cover his palm seedlings. The harvest, safe from predators, will guarantee an income and food for his family for several months next year. 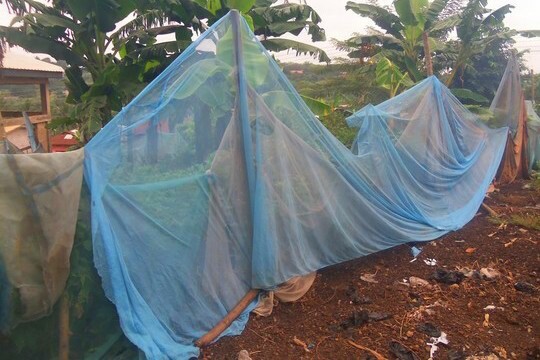 Yaw sees no reason to remove the net from the seedlings and rather use it to protect himself and his family: food, not malaria risk management, is his family’s most basic need. He does, however, feel that something should be done about the mosquitoes. He was happy when the government started spraying insecticide in his village two years ago. “But after a year the spraying stopped again,” he says. He doesn’t know why. Yaw’s five-year-old grandson Kwaku has mosquito bites all over his body. He also feels warm. “Malaria,” says Yaw. “These programmes aren’t working,” says doctor Ernest Kwarko, gynaecologist at Komfo Anokye hospital. Kwarko, who says dozens of pregnant women and their infants every day, says one in four show symptoms of malaria. Though the NMCP recently celebrated a decline in cases, he says, he has not seen such a decline. Neither has Richard Menyo in Lomnava, who says that every week four people come to him ‘with their babies complaining of malaria.’ Lomnava counts only 400 inhabitants: if Nenyo is right that there are four cases per week, that would mean 200 cases –half the population of the village- presenting with malaria every year. The official numbers are puzzling all by themselves, too. Though they show a decline in Ghana between 2014 and 2015 (from 11 million to 8,4 million cases of malaria per year), they also show a massive increase between 2003, when the donor-aided effort to fight malaria started, and 2014: from three million to eight-and-a-bit million cases per year. Did more people get sick or did more people get counted? What would the figures be like if the ‘home deaths,’ -likely the majority of cases, since poor, sick people usually don’t have the means or strength to make it to an often faraway hospital-, were counted too? In the DRC, the WHO figures of confirmed malaria cases have gone up since 2006 from zero to twenty percent of the population in 2014. But that is, again, probably a result of better counting in the hospitals than an approximation of the real situation –if you believe these numbers you’d have to believe that there were no malaria patients in the DRC in 2006. And even today in the Congo, most people fall sick and die at home, far from any medical facility, too. It is the interview with Collins Nti, chairman of a civil society structure called the Country Control Mechanism, -established by the Global Fund as its Ghanaian working partner-, that the crux of the problem emerges again: local governance. Or rather, the lack thereof. When we talk of responsibility for insecticide spraying in his country, for example, Nti blames only the Global Fund. “Money for spraying was in our proposal. But then they didn’t give us.” But surely donors can’t carry the accountability for everything that goes wrong in Ghana? Couldn’t the health authorities have found alternative funding to continue the spraying? “We had a meeting with them last week. We are looking for other funds.” Isn’t that a tad late? “It’s just that we did think that we would get the funds,” he says. The African Union decreed in 2001 that all member countries should spend ten percent of their budgets on health care. None do (8). The experience of the African journalists on the ground during this investigation shows just how unaccountable the ‘malaria elites’ in their own countries are. Apart from some lucky breakthroughs –as per the interviews above- Francis Mbala has been refused documentation, has been stood up at fixed appointments more than a dozen times, and has been arrested. In Tanzania, Erick Kabendera has not been able to get the list of beneficiaries of the Global Fund’s most recent grants. Zack Ohemeng Tawiah, in Ghana, has travelled three times from Kumasi to Accra (a five hour journey each way) in vain to try and see a Malaria Control Programme official. In the end he has been telephonically referred to the website of the Global Fund in Geneva. “All that the Global Fund wants to put out, it puts on its website,” spokesperson Eunice Adjei said before hanging up the phone. The donor industry keeps partnering with, financing, and therefore empowering, scores of such unaccountable, opaque and incompetent malaria elites. When the Global Fund’s chief risk officer Cees Klumper decided to visit Niger, north of Ghana in West Africa, he was able to call a minister to meet him on a Saturday. “He showed up with his entire team. It was a public holiday, too.” Klumper tells the anecdote as an illustration of how beholden some of Africa’s elites are to donors: dependent on them for money, they won’t risk offending them. Klumper does, however, feel that the programmes are working properly and that the Fund manages to keep corruption to a minimum. “We calculate that only 1,7 to maximum six percent of funds is lost to corruption,” he says. Reading the multitude of programme reports by consultants, in development jargon about targets and projections, with impressive graphs, on the Global Fund website, gives the impression that all is really well. Global Fund Programmes executed by the Global Fund are rated ‘adequate’ by the Global Fund. Numbers of people accessing treatment are in the seventy and eighty percent range in most reports we see. The general figures about insecticide spraying are also apparently on target everywhere. It is like our team has operated in a different universe. An enormous gap separates the realities of Bandalungwa, Volta, Ashanti and Dar es Salaam from the world of donors and their ‘malaria elite’ partners. Karel van Kesteren, ex ambassador for NL in Tanzania and author of a book ‘Verloren in wanorde’ (Lost in confusion), which deals largely with the aid question, compares donor aid to a hospital drip. ‘Developing countries are hooked to a permanent drip of which only the elites draw benefits,” he says. “Local people do not.” Nobel Prize winner for economy in 2015, Angus Deaton also argues against the type of aid that reduces accountability of governments vis a vis their own citizens. “We cannot help the poor by making their already-weak governments even weaker,” he says in his essay ‘Weak States, Poor Countries’. Deaton has said repeatedly that, where this happens, donor aid is actually harmful.